TheArmenianKitchen.com : Why do we watch food when we could be eating? Why do we watch food when we could be eating? We're fascinated by food shows on television. Not just by the shows themselves, but by their raging popularity. Why do we love to watch other people eat? The Food Network got so big it recently cloned itself to create the Cooking Channel. Luckily for us, this one's not in our cable lineup or we'd probably sprain a finger clicking the remote back and forth. Like millions of Americans, we just can't get enough of TV chefs. Well, in truth, we actually have had enough of some of them: We're guessing Emeril's relatively modest presence on the tube these days means we're not the only ones who got a little tired of hearing "Bam!" every few seconds. But Emeril, at least, is a real chef -- and we're told his food really is good. Some other celebrity chefs...well, we wonder about the "chef" part. And we really, really wonder about some of the bungling contestents on the various TV cooking competitions like Hell's Kitchen -- although, who wouldn't drop a plate or two with Gordon Ramsay screaming in your ear? 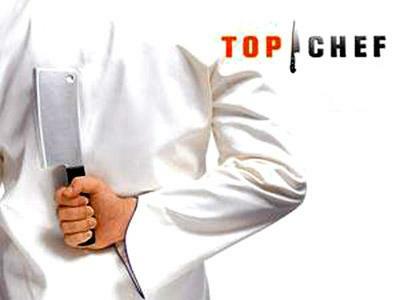 But the show that really bugs us is Top Chef, Bravo's highly rated and much-blogged-about elimination tournament that supposedly crowns the country's most talented new chef each season. The contestants all seem to have advanced kitchen skills, but many of their dishes just seem wacky -- no doubt fashioned to entice the equally wacky judges. The strangest episodes of all involve forays into something called molecular gastronomy, which delivers "food" in unnatural forms and colors that resemble chemistry experiments more than old-fashioned cooking. I just don't get the point. I mean, if I want food sprayed on my plate, I'll buy a can of Easy Cheese. On one recent episode, a judge berated a contestant for serving salad in a bowl. A salad is supposed to be served on a plate, the judge asserted, so the diner can continue tossing it. I wondered: Is it possible this guy doesn't know that salads served on flat plates get tossed in bowls first? Maybe. But really, why does the serving dish matter at all? I don't ever remember saying, "That was a great meal -- but those plates were the wrong shape!" Of course, I am not a sophisticated diner. Thank goodness. 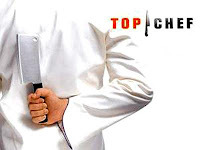 I'm so unsophisticated that I was appalled when Top Chef's top chef, Tom Colicchio, recently took a contestant to task for serving lamb well-done. I can't taste what's on TV, so maybe this cook really did vulcanize that particuarly slice. But I've heard this general complaint before, from Colicchio and other celeb cooks who think lamb is properly -- and only -- served pink. I have no quarrel with their taste: If you want pink lamb, eat pink lamb. You can eat pink chicken stuffed with pink flamingo feathers if it makes you happy. But why do they quarrel with my taste? Why should the supposedly sophisticated culinary clique that dominates TV and a handful of very expensive restaurants in New York and Los Angeles get to decide what's "right?" Luckily, they really don't, just as they don't have to worry about what I think. They'd starve waiting for me to walk into their dining rooms. When I'm in a strange city, I'm much more likely to look for the nearest diner than a so-called fine dining restaurant. And when the diner is Greek, as it so often is, I never hesitate to order the lamb because I know it will be well-done. I'm with you. And now I want lamb. Diner. Sounds good. Meet you there. One bread - Two names?